1 of 4 Peel, core and thinly slice a Granny Smith apple. 2 of 4 Saute apple with butter. Add bacon and cook 1 minute. 3 of 4 Spread 4 tortillas on a nonstick baking sheet. 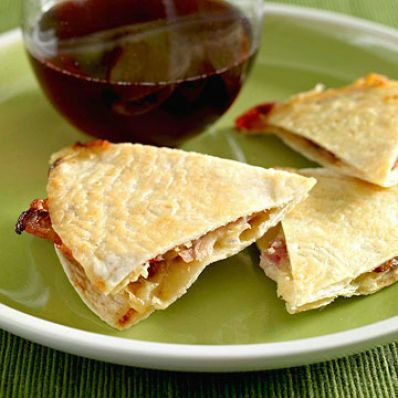 Divide apples among tortillas; top apples with sliced Brie and 4 more tortillas. 4 of 4 Bake at 425 degrees F for 10 minutes, flipping halfway through cooking. Cut into wedges and serve.